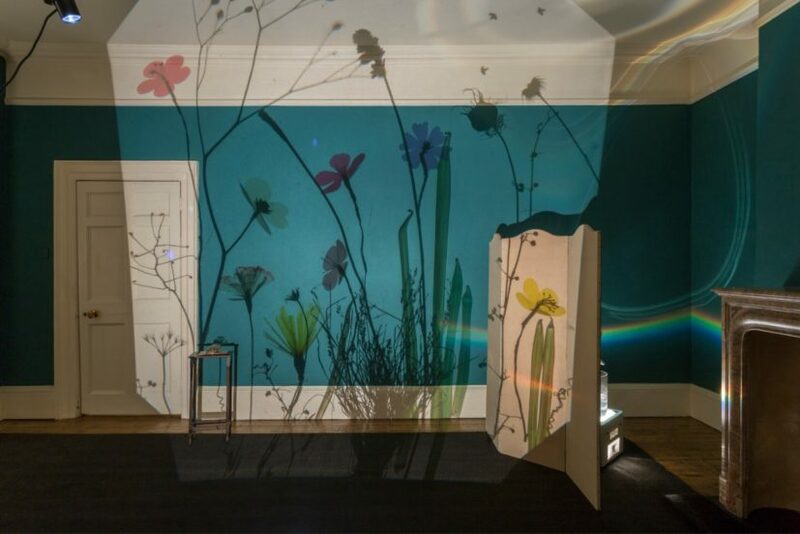 An attractive interplay between light, glass, sound and nature transforms the interiors of a Georgian house in such an enchanting way that you may wonder whether you have entered a secret garden once the front door at Danielle Arnaud’s gallery has closed behind you. But no, you actually find yourself in re Composing, an exhibition by Helen Maurer that is a reinterpretation of the commissioned re Connecting re Creation for the Church of The Holy Trinity in York. For this latest show, Maurer’s installations intelligently engage with the site’s architectural context. Coloured splinters of dichroic glass, known for its quality to reflect light, are laid out in various arrangements throughout the space. 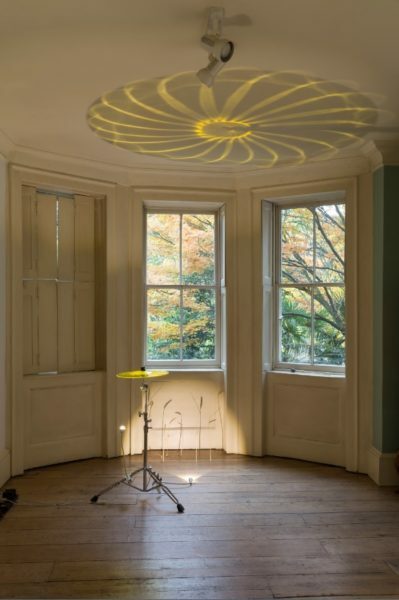 Lit by simple LED reading lamps, they produce ephemeral mosaics of light on walls and ceilings. Another striking light source is the overhead projector, reminiscent of dry lectures or presentations but here employed for a rather different purpose. 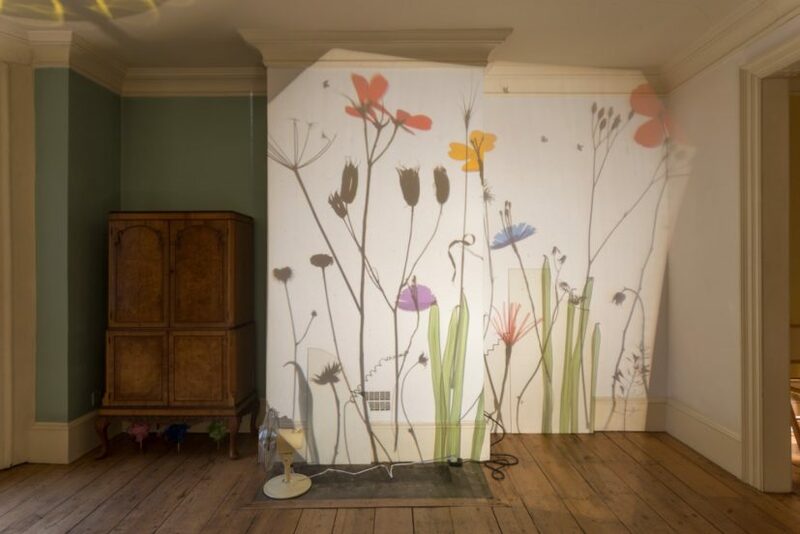 Miniature arrangements of glass objects and dried flowers cast magnified scenes redolent of summery meadows onto the walls. Stems and petals reach far above your head, as if you just went down Alice’s Rabbit Hole. Maurer is intrigued by illusion and scale, and says that her fascination for projection could have its origins in the urge to “get something large-scale from the smallest source”. Themes including shadow and reflection are likewise characteristic of Maurer’s oeuvre, and a nod to the imagery she is confronted with daily, living on a boat and being surrounded by water. Sound is equally fundamental to Maurer’s work. 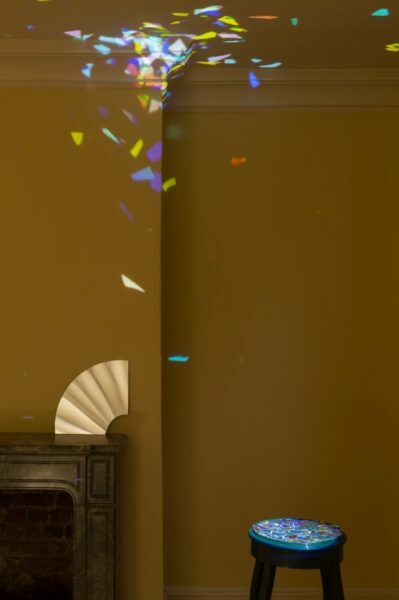 In this show you are invited to play the glass instruments produced by Maurer herself: a glass church bell hanging from a ladder, a translucent yellow cymbal that is lit from below and projects a sun-like shape onto the ceiling. There are continuous sounds such as wind chimes made from Capiz shells as well as the perpetual hum of the projectors. A set of hymn books, their pages carefully folded to give them a sculptural quality, are a mere suggestion of sound and give religious presence in a secular space. In re Composing Maurer examines the rudiments of nature, architecture and religious worship. Although at first Maurer’s compositions might seem straightforward, upon closer examination you discover that they are an outcome of thorough artistic experimentation and exploration. Finally, there are several paradoxes at play that one cannot ignore: the aesthetic delicacy of dried flowers and glass versus the sturdiness and industrialism of the lamps, projectors and air fans; the ‘natural’ tinkling versus the mechanical humming; and lastly the inherent beauty of nature itself versus human (and artistic) intervention. This exciting paradoxical tension allows you to have a transcending experience yet also ensures you keep both feet on the ground. Helen Maurer was born in Portsmouth and now lives in London. She studied Fine Art and Theatre at Brighton University before completing an MA in Glass at the Royal College of Art. Maurer has worked on several public commissions, most recently creating a site-specific installation for the Arts Council England Offices. 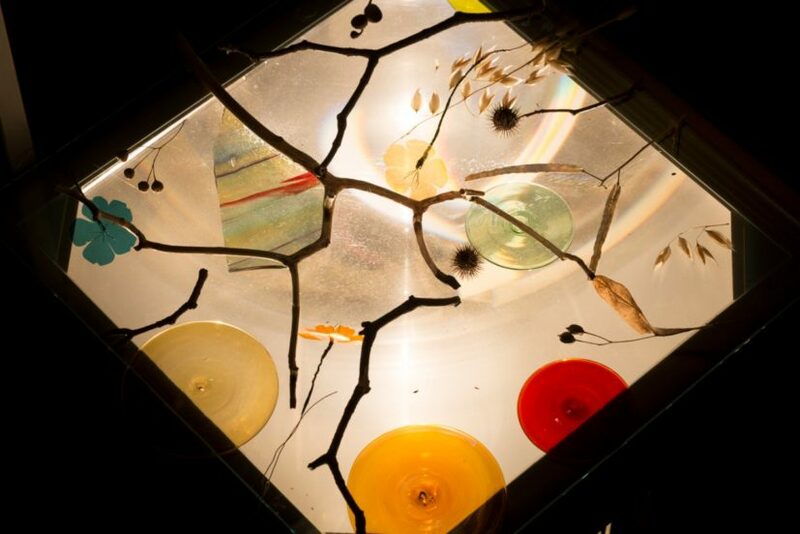 She teaches part time at Central Saint Martins and won the Jerwood Prize for Glass in 2003.